The Joojoo web tablet (AKA crunchpad) is a pretty neat idea! I kind of just wish Google was making it. I mean, if there's any company in the world suited to making one, it's Google. It's Cool But Makes No Business: Unlike the impending Apple Tablet, the Crunchpad was supposed to be low margin, subsidized by soft revenue from content providers and it still turned out to be $500. That's possibly too much for a tablet that only surfs the web when netbooks can do it for half that price. At this point in time, to make a web tablet a fair value, you'd almost have to give it away for nothing. But like so many of Google's side projects, the tablet doesn't have to have immediate or direct paths to monetization — Google simply likes to engage users first as Eric Schmidt said at the Google Navigation launch for Maps, a product equivalent of what Tom Tom charges over a hundred sollars for, which they launched for free. Correction: It Makes No Business Sense Unless You Are Google: Oh wait! Google simply makes more money when more people go online, thanks to adsense. Whoa, what a coincidence! The only thing a web tablet would do is get people online! That's not too dissimilar to Google's free software model for Android, where Microsoft has to charge licensing fees to manufacturers because they don't have enough revenue from online services or ads to make up for the cost. Software Is the Issue, and They've Already Got It Figured Out: Chrome OS is the perfect operating system for a web tablet. 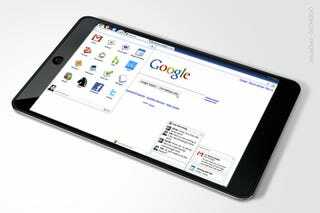 It's a fast operating system that's completely browser centric. While Tablet hardware is somewhat a commodity (Exception: touchscreens of the size used in JooJoo aren't super cheap yet), the big issue is software. And Chrome OS is ripe for a web surfing tablet. They're Already Supposed to Be Fishing Around In Hardware: The rumors and a source of ours says Google is already working on a hardware phone, based on an advanced version of Android. However little sense that makes, that's what we've heard. And once you're in the hardware game, what's one more piece of gear with off the shelf ion/atom netbook hardware and a capacitive touchscreen? Let me be clear: There are no sources or tips that inspired this piece. This article is in no way anything other than a pipedream to have the richest web and user focused tech company today build a cool device that probably wouldn't make them any money, and lets face it, it wouldn't need to make them any money because, again, they're so rich they can basically give these things away for nothing. I mean, Google can give away over half a million of these things at $300 a pop and not even put a 10% dent into their profits from last quarter. If you stare at the numbers long enough, I almost think they should give us each one for Christmas. How about it, Google? I promise to click around on a lot of ads!